Brisbane - England's James Vince was spectacularly run out with a century beckoning on his Ashes debut as Australia hit back to leave the first Test finely balanced after Day 1 on Thursday. 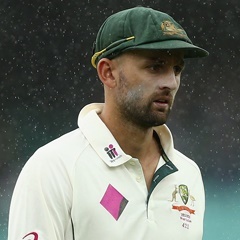 Captain Joe Root and Alastair Cook both fell cheaply before the tourists reached 196 for four when bad light ended an attritional, rain-affected day at the Gabba ground in Brisbane. Vince top-scored as the tourists scored slowly, but Australia loosened their hard-earned advantage when they dismissed him along with the key wicket of Root late on. Vince, on 83, scampered for a quick single off Josh Hazlewood but a brilliant off-balance throw from Nathan Lyon prowling in the covers caught him well out of his ground. Vince, who was earlier put down by recalled wicketkeeper Tim Paine off Lyon, led a fighting English rearguard with Mark Stoneman after the early loss of Cook. It took a special piece of fielding from Lyon to end Vince's 170-ball, four-hour vigil and give the Australians hope on a rugged first day on an unresponsive Gabba pitch. Eighteen runs later, Root fell leg before wicket to Pat Cummins for 15 off 50 balls after a review, in a another huge scalp for the toiling Australians. At stumps, Dawid Malan was batting on 28 along with Moeen Ali, whose 13 included the day's only six. Australia have a formidable record at the intimidating 'Gabbatoir', where they have not lost a Test match since 1988, and where England haven't won in 31 years. But Vince and Stoneman had few problems mastering Australia's vaunted fast bowling trio before Stoneman, the Surrey opening bat, was bowled between his bat and pad by Pat Cummins for 53 nearing tea. It looked as though Vince would go on and crown his resilient innings with a century after passing his previous highest Test score of 42. Vince survived a big moment nearing tea when he edged Lyon on 68, only for the deflection to bounce away off the top of the gloves of recalled wicketkeeper Tim Paine, much to the Australians' anguish. It was a spirited recovery after the early wicket of Cook in the third over. The former England captain only lasted 10 balls before he edged pace spearhead Mitchell Starc to Peter Handscomb at first slip for just two. It continued an uncertain start to the Ashes tour for Cook, who amassed 766 runs in England's 3-1 series victory in 2010-2011 but who has just one half-century in five innings on the current visit. Stoneman continued his prolific form following his century and three half-centuries in the four innings of the warm-up games. Opener David Warner (neck) and lower order batsman Shaun Marsh (back) were both passed fit to play after injury concerns.